How often you do these desk stretches is up to you, but taking a few minutes a couple of times a day beyond your lunch break to get the blood flowing can make a huge difference in your circulation. You might also be surprised to see how much tension you stop start carrying in your neck, shoulders and back. Whether you work at a desk all day long or your workspace is in a train, plane or automobile, FUTURO Graduated Compression Legwear is designed to provide men and women with more comfort and support throughout their busy days. The legwear reduces swelling and improves circulation, and come in a variety of styles, sizes and colors. You can find them right in the pharmacy section of lots of major retailers including CVS Pharmacy. 3. Get up and move. Your eyes, too. Getting up and moving is such a simple, easy way to get the blood flowing through your body — and importantly, flowing up to your brain, which can actually make you more productive. So take advantage of every opportunity you have to get up and move more, whether it’s walking a bit farther down the hall to get a glass of water, offering to bring that extra chair from another office to the conference room, or taking the stairs rather than the elevator. If you’re like us and feel like you blink and three hours at your desk has passed, try an app like Balanced, which pings you with reminders when you need to get up and move. Or just program your phone or computer to nudge you with a gentle alarm alert every hour or so. As for your eyes, they need to move too! Experts recommend you use the 20-20-20 rule if you look at a screen all day long: Basically, you should be sure to look away from your screen at something 20 feet away, every 20 minutes, for 20 seconds. This not only gives your eyes a break, it can help decrease the chance of developing a headache if you’re prone to getting them. 4. Hydrate. And that doesn’t mean drink more coffee. We find the best way to stay hydrated is to have water easily accessible, which means keeping a reusable water bottle on your desk and hopefully, a refill source close by. If you’re a coffee drinker, consider doubling up on water — have a glass or two for every cup of java. 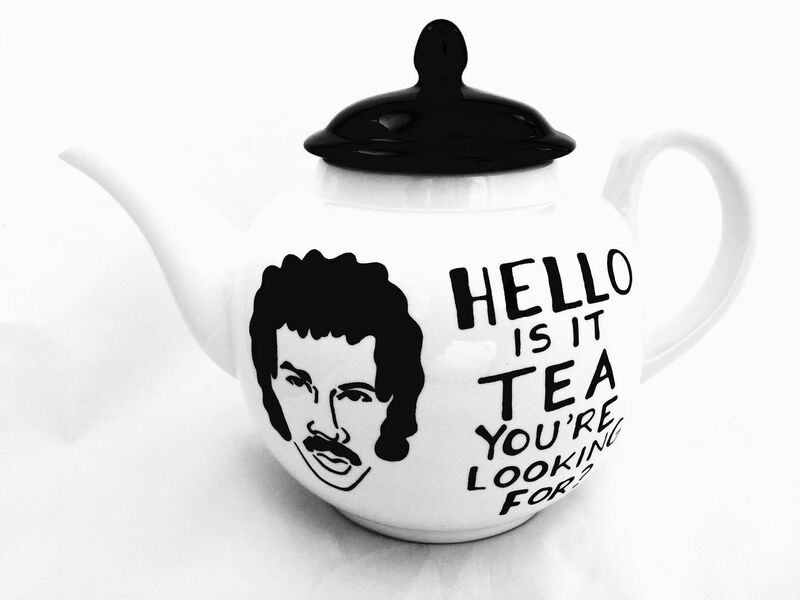 Or think about switching to a non-caffeinated tea by the afternoon, even better if it’s tea with a sense of humor like this pot from favorite Etsy shop, Mugoos. As you well know, cutting back on caffeine can help with sleep later on too and that’s never a bad thing. 5. Eat healthy. That includes snacks. Being prepared when it comes to food really helps you make healthier choices; and you already know that if you’ve ever gone grocery shopping without a list or when you’re hungry. (Hey, how did all these donuts get in my cart?) If you want to eat healthier at work, pack a lunch for yourself instead of buying something impulsively. If you do eat out, make sure your local take-out places or office cafeteria have options that include proteins and veggies, not just the fried stuff. This goes for snacks as well. 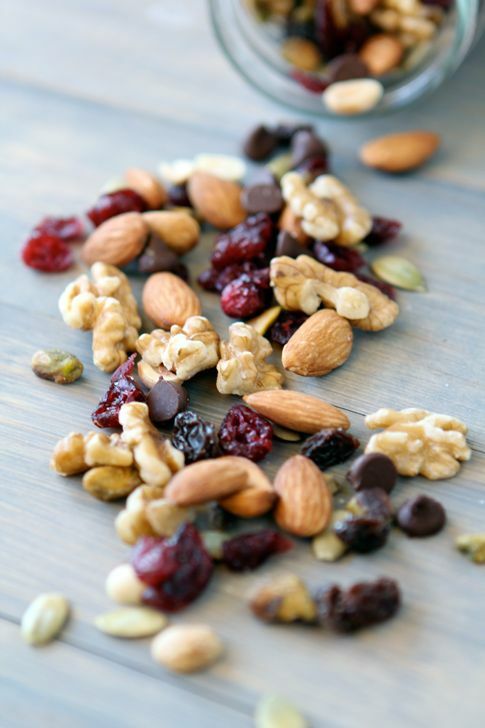 We love keeping nuts, dried or fresh fruit, and other healthier choices within arm’s reach so that when we’ve got the munchies, the selection is limited to the good stuff. As in, not so many carbs, not so much sugar. Our post on healthy DIY travel snack recipes are all perfect for desk snacks too because they’re easy, portable, and not so messy. Thanks to our sponsor FUTURO Legwear for helping to make those long days at a desk more comfortable. 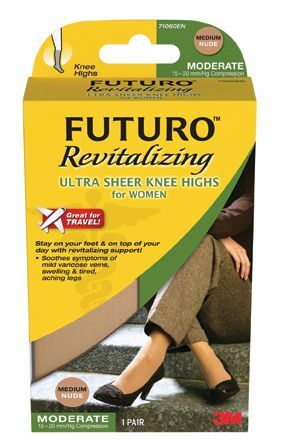 You can find them at lots of major retailers, your local CVS Pharmacy, or on their website Futuro.com. Great tips! We have the same Griffin laptop stand at our office and take turns using it.